George Vega is an Illustrator and Graphic Designer based in New Jersey. Over the past decade he has worked in Web Design, Flash Animation, and Print Design. 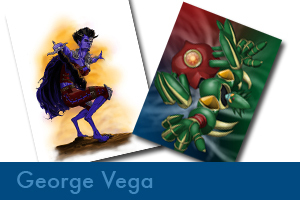 In his career he has been fortunate enough to use his skills in both Illustration and Graphic Design. His goal is to one day work on major properties in the comic and gaming industry.